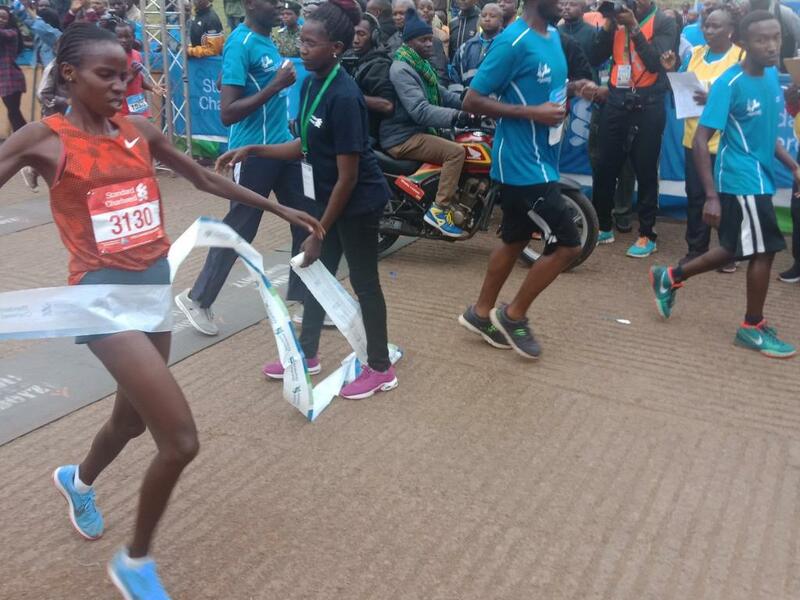 Nandi residents were left basking in glory on Sunday, after the Standard Chartered Nairobi Marathon 2018 produced a master class from her athletes. Not only did Josephine Chepkoech won her first race, but the race was heavily dominated by the Source of Champions names who scooped the subsequent positions 1,2,3,4. The county government of Nandi sponsored 49 athletes to the marathon. 36 male and 13 female participants. The selection was based on the athletes’ best time and a recommendation from his/her coach. Nandi Countys’ Josephine Chepkoech won women’s 42km races in the Standard Chartered Nairobi Marathon on Sunday morning. Chepkoech finished in two hours and 35 minutes ahead of her cousin Cynthia Jerop and Joy Kemuma. Chepkoech said this was her first marathon and that she had been participating in road races and 10km races. “I am very happy. I thank God for helping me win the race. I also want to thank the county government of Nandi for sponsoring 49 of us to participate in this race,” she said. Valerie Aiyabei won the women’s 21 kilometre race followed by Irine Kimais from Nandi County followed by Sylvia Kibet in third position. Julius Kiprono finished second in the men’s 42km race. In the men’s 21 km race, Mathew Kiprotich finished first in 1:04:57. Nandi County’s James Kipsang Bett was third. In the veterans 21km race, Peter Lelei finished in 1:27:40. Nandi CEC for Youth, Sports and Arts Elly Kurgat congratulated the athletes for flying the Nandi flag high in Kenya’s capital Nairobi and gave an assurance of the government’s continuing efforts to find ways to improve the state of sports in the county. “Little by little, we can fill in the shortfall that you’ve long been enduring. And pretty soon, you feel the dawn of a better times ahead,” Kurgat said. The initiative of the marathon is to raise funds to help children below 15 years who are visually impaired. Funds raised are channeled to the initiative dubbed ‘Seeing is Believing’. The winners of the full marathon will take home Sh1.5 million, Sh650, 000 and Sh350, 000 respectively. Those who won the half marathon will receive Sh200, 000, Sh150, 000 and Sh100, 000. In the CEO’s 3 km race category, Durand Guillaume Fairmont Hotels came in first. Nairobi Governor Mike Sonko finishing in the eighth position. Other participants were Sports Chief Officer Kennedy Tanui, Youth and Arts Chief Officer Nelson Ligaga, Nairobi woman rep Esther Passaris, Senators Aaron Cheryoit (Kericho), Kipchumba Murkomen ( Elgeyo Marakwet), Machakos Governor Alfred Mutua, US ambassador Bob Godec and Nandi Sports Officer Lydia Chepng’etich.